How is this transcendental adjustment used in feng shui? The BTB feng shui school is full of mysterious, spiritual and even magical procedures; many of them called transcendental feng shui cures. The abbreviation BTB stands for Black Sect Tibetan Tantric Buddhist School of Feng Shui, so it is obvious that this feng shui school is based on a strong spiritual foundation. One of the most popular transcendental adjustments in the BTB school of feng shui is the so-called 3 Secrets Reinforcement. It is not a feng shui cure per se, but rather a way to apply any feng shui cure, a concept or a procedure used to make any cure you choose to place in your home or office more powerful. NOTE: Please keep in mind that in BTB this info is guarded by honouring the tradition of red envelopes. Since you and I are communicating on-line and you cannot really give me red envelopes, the next best thing for you is to read and acknowledge the BTB red envelopes tradition. The concept of Three Secrets is based on invoking the combined power of Body-Mind-Speech when you place any feng shui cure. Even though this sounds mysterious or maybe even complicated, it makes a lot of sense and it is actually what many of us do, often subconsciously, when focusing on something really important. SECRET #1: Your Body. 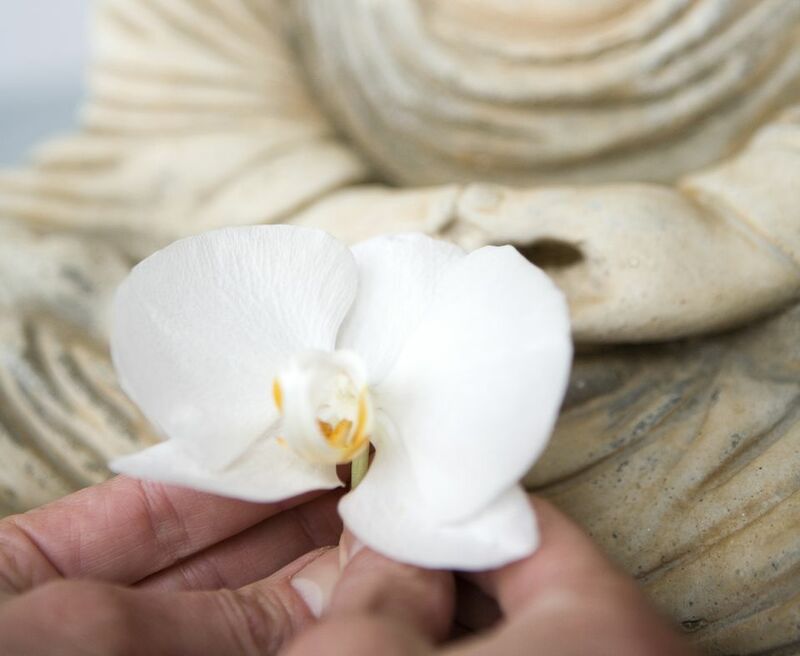 When placing any feng shui cure, be it a crystal or a flower vase, a BTB feng shui practitioner will reinforce the power of the cure by performing a specific hand gesture, or mudra. Most often, this is the hand ousting mudra, also called Karana mudra, which can dissipate negative energy. SECRET #2: Your Mind. Focusing your mind on the clear intent of your work is obviously beneficial. In BTB feng shui, a practitioner will clearly visualize his or her desired goals and outcomes when placing a specific feng shui cure in a home or office. For example, if you place a picture of a happy couple in the Love & Marriage area, you will spend some time clearly visualizing the love energy you want to attract in your life. SECRET #3: Your Speech. BTB School of feng shui uses a variety of mantras - from the calming heart mantra to the Green Tara mantra. Of course, these are not specific feng shui mantras, but rather well-known Buddhist mantras. In case of placing a feng shui cure, the Six True Words Mantra is used 9 times: Om Ma Ni Pad Me Hum. This is a very well known mantra, or prayer, with a complex meaning, loosely translated as I Bow to the Jewel of the Lotus. How Do You Perform the 3 Secrets Reinforcement while Placing Your Feng Shui Cure? Usually, the practitioner will place the feng shui cure in its intended spot, then perform the ousting mudra 9 times (in the space around the cure), at the same time saying the Six True Words mantra and visualizing the desired results. However, there are no strict rules about it. You can also place the cure & perform the mudra (the body part), then say the mantra (the speech part), and afterward focus on the desired results (the mind part). Working with number 9 is common in many feng shui applications, as 9 is considered the highest number. So, see if you can incorporate it in your Three Secrets Reinforcement: you can perform 9 mudras, say the mantra 9 times and maybe visualize the desired results for 9 minutes, or focus on 9 steps to achieve your goal. So, this is about it for the essence of the Three Secrets Reinforcement in BTB school of feng shui. As you can see, the procedure has a lot of common sense and merit to it. However, it is also important to understand that this is not rigid knowledge because you are working with energy, and nothing in the world of energy is either rigid nor fixed. Stay flexible, stay open, keep exploring, and accept only the knowledge that feels right to you. This is true for everything in life, and especially so when it comes to applying such an ancient body of knowledge as feng shui.